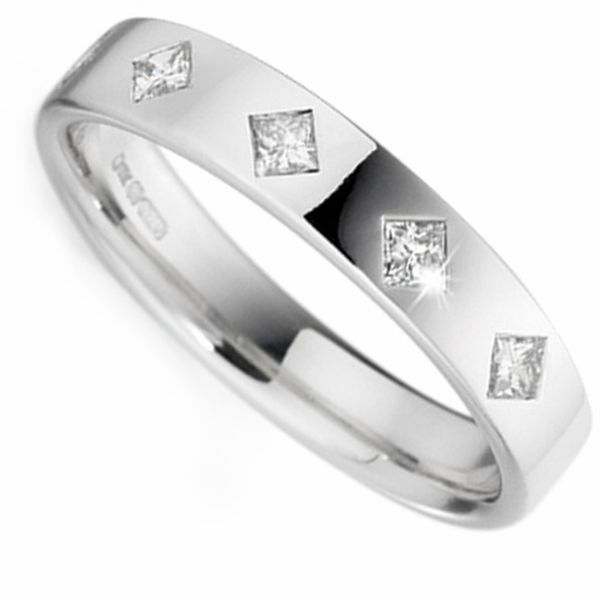 0.25cts 4 stone flush set princess cut diamonds over a flat court comfort fit 4mm wedding band. ﻿Perfect for every day wear, the Flush setting of four Diamonds totalling 0.25ct means they are set securely within the 4mm Flat Court Wedding Ring. This ring will fit a finger size M, and the Princess cut Diamonds have been graded a G Colour and VS2 Clarity and sit within a band created in 18ct White Gold. Available for immediate dispatch, your ring can be with you with Next Day Delivery (Within the UK), and with you in just a few days if you live internationally. It will be delivered by a trusted courier and be luxuriously wrapped in our bespoke packaging.